For a friend's granddaughter. Hope she likes it! Made the hair bow using Just Dandy Studio Ruffle Ribbon. Feeling so crafty! Sewed the button onto the ribbon and a long bobby pin. Adhered a circle of Wild Berry Dots paper to the center, added Ranger Stickles and a sparkly gem. Not my comfort zone, but I am going to birthday party for an 8 year old girl and thought, why not? Put a gift card inside. Hope she likes it. 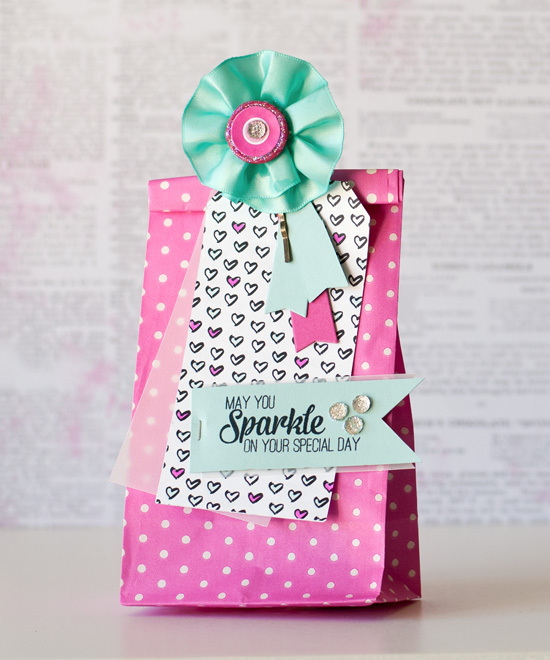 Just Dandy Studio supplies: Mini Hot Pink Polka Dot Mini Bags, Ruffle Ribbon, and Wild Berry Dots wrapping paper. The black and white hearts paper (colored with Copics) is from Stampin Up! Sentiment from The Ton. MOOD WHEN DONE = Crafty! Very crafty! And a little girl will love it.